1. 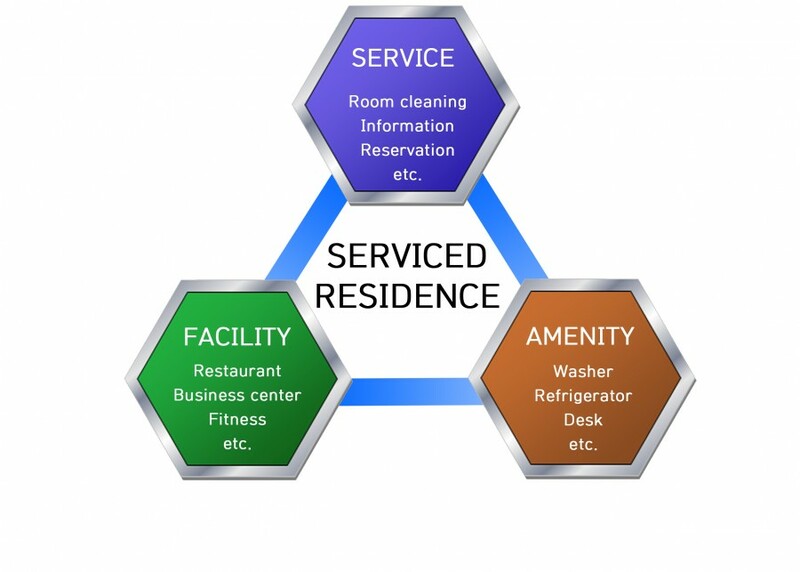 What is a serviced residence and how is it different from ordinary hotels? Serviced residences are residential facilities similar to efficiency apartments with hotel services and also accommodation facilities with convenience features such as a living room, laundry room, and kitchen. While it provides guests with hotel class services with various convenience facilities and ancillary facilities, including a restaurant, a fitness center and a business center. the rates are lower than hotels, and this design is winning favorable responses from domestic and foreign visitors, regardless of their length of stay, and guests visiting for business purposes. EVER8 will continue to strive to provide high-end services while maximizing the advantage of the serviced residence format. 2. What are the residential rates? basic use of a guestroom, as well as packages and events. Please check the details on our homepage before you choose the services that best fit your length of stay and the number of guests. We also offer special rates for corporate guests visiting us for business purposes and groups. Contact us at anytime to inquire about our rates. 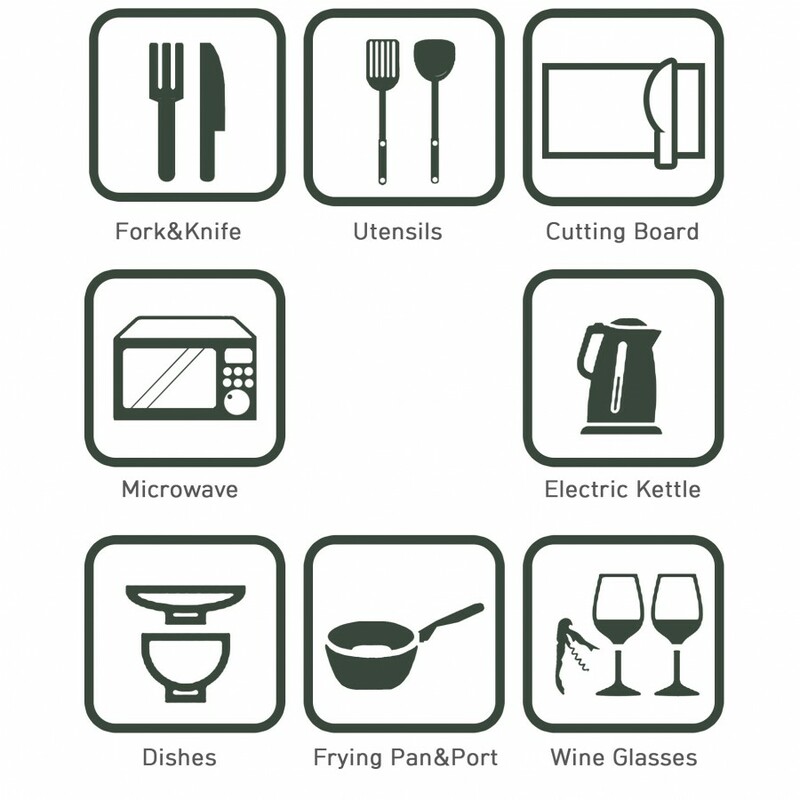 EVER8 is a serviced residence with cooking utensils and tableware for simple cooking and dining inside the guestroom. Each room is equipped with a microwave oven, an electric kettle, a variety of tableware, and wine glasses, along with an electric cook top and rice cooker and pots and frying pans. 4. How many guests does each room accommodate? All guestrooms of EVER8 are basically for two guests. However, TRIPLE and FAMILY TWIN rooms can accommodate up to three adult guests. When your children are accompanying you, please contact us in advance and we will find the best accommodation for you. 6. Is Wi-Fi free of charge? EVER8 provides free Wi-Fi for each room and lobby. 7. What are additional facilities? For additional facilities of EVER8, there are cafeteria, fitness center, business center, and café. 8. What are rental items? We lend adapter, umbrella, HDMI USB, Induction Cooktop, rice cooker, transformer, humidifier, baby bed (Deluxe Double Room only provided), drying rack, and steam iron for free of charge. ** As the limited number of the mentioned above items are kept in stock, please contact the front desk clerk in advance. Also please be aware that items may not be provided due to out of stock. 9. Can I check in early? For the early checking-in, we can check the possibility depending on the room status of previous day. However in most of cases, because the hotel is managed mostly by closed dates regardless of weekdays or weekends, unless otherwise special occasion of early checking-in, the early checking-in is not possible. (The request of early checking-in due to flight arrival time is not accepted.) Yet, we may store your luggage at the front desk. This is our regulation to receive you with the best room condition, and thus please excuse us. 10. Can I check out late? EVER8 is managed with the standard of 12 o’clock checking-out and 15 o’clock checking-in. Three-hours is the minimum time for us to clean and check the checked-out rooms to prepare for them to receive you, and the late checking-out may affect our maintenance time of rooms. If you are required to stay further due to unavoidable circumstance, you must check the possibility in advance, and there will be an additional fee of 11,000 Won per hour. Especially, the checking-out after 15 o’clock may hinder sales of room on the day, and thus please excuse us that the rooms may not be provided after then. This is our regulation to serve the best room for you, and thus please excuse us. 11. Do you provide breakfast? Breakfast is provided at Cafeteria on the first basement of EVER8 HOTEL. 12. Can I have pick-up service? We are sorry that we do not provide the pick-up service for airport <-> hotel. If you depart from Incheon Airport, please take Bus No. 6002 to get to the bus stop near hotel. It takes about one hour and 10 minutes, and you may check the direction from bus stop to hotel at the E-concierge menu at left. ** The estimated time is varied depending on the traffic situation. 13. How can I check my reservation? For reservation via website, you may check View Reservation menu for your reservation. If you made a reservation through other website, you may check it from that website. 14. How long does it take and how much is fare if I take a taxi from the airport? The taxi fare and time may vary due to traffic.